Joseph Martin McCabe (1867–1955) was an English writer and speaker on freethought, after having been a priest earlier in his life. McCabe was born in Macclesfield, Cheshire, on November 12, 1867. He entered the Franciscan order in 1883 at the age of 19, and in 1890 was ordained into the priesthood with the name Father Antony. After 13 years, McCabe had become disillusioned, and he left the priesthood on February 19, 1896. At first he described himself as an agnostic, but he later came to prefer atheism. Shortly after leaving the priesthood, McCabe began writing. He wrote a pamphlet on his experiences, From Rome to Rationalism, published in 1897, which he then expanded to book length as Twelve Years in a Monastery (1897). He then wrote prolifically on science, religion, politics, history and culture, writing nearly 250 books during his life. Many of his books and pamphlets were published by E. Haldeman-Julius, both as Little Blue Books and Big Blue Books. Over 100 Big Blue Books by McCabe were published. McCabe was also respected as a speaker, and gave several thousand lectures in his lifetime. 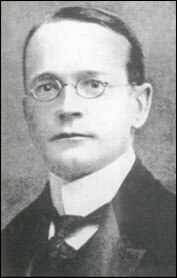 McCabe is also known for his inclusion in G.K. Chesterton's book Heretics. In a previous essay he took Chesterton to task for including humor in his serious writings. By doing so, he allowed Chesterton to make the quip "Mr. McCabe thinks that I am not serious but only funny, because Mr. McCabe thinks that funny is the opposite of serious. Funny is the opposite of not funny, and of nothing else." In about 1947, McCabe accused the Encyclopædia Britannica of bias towards the Catholic Church. He claimed that the 14th edition, which had been published in 1929, was devoid of the critical comment about the church that had been in the 11th edition. McCabe similarly accused the Columbia Encyclopedia of bias towards the Catholic Church in 1951. These and similar actions have made him be termed a "Catholic basher" by his Christian critics. Biographer Bill Cooke, however, disputes the allegation, citing McCabe's opinion that "Catholics are no worse, and no better, than others", and "I have not the least prejudice against the Catholic laity, which would be stupid." . McCabe was also active in organizations, although his biographers note that he had a difficult relationship with some of their leading figures, and consequently relations between McCabe and various groups could also be strained. From 1898–1899 he was secretary of the Leicester Secular Society, and he was a founding board member in 1899 of the Rationalist Press Association of Great Britain. McCabe's freethought stance grew more militant as he got older, and he joined the National Secular Society in the year before he died. McCabe died on January 10, 1955. ^ "The Columbia Encyclopedia's crimes against the truth by Joseph McCabe"
Cooke, Bill (2001). A rebel to his last breath: Joseph McCabe and Rationalism. Prometheus Books. ISBN 1-57392-878-X.